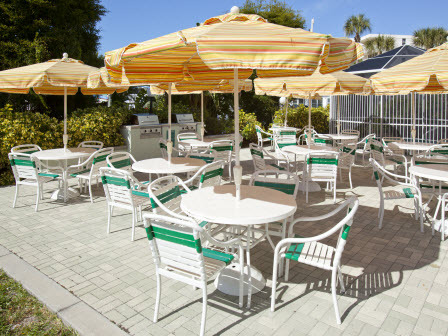 Calini Beach Club is located 12 miles from the Sarasota/Bradenton International Airport. From the airport, take U.S. 41 south 10 miles to Route 72/Stickney Point Road. Turn right and go one mile to Midnight Pass Road. Turn left and go one block to Seaside Drive and turn right. From I-75, take Exit 205 and go west to Midnight Pass Road (approximately 10 miles). Turn left and go one block to Seaside Dr. and turn right. A car is recommended to fully enjoy the area. Sorry, we love them but no pets. For additional rental information on this and other properties please visit FloridaRent.com.